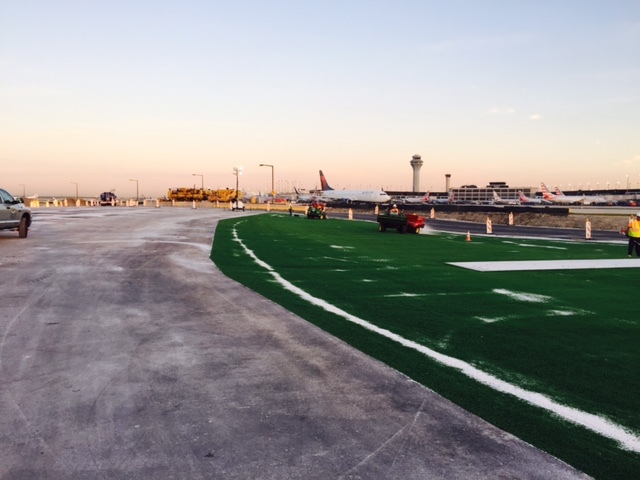 Chicago O’Hare Airport – Target Technologies International Inc.
Chicago O’Hare Airport was one of the first airports to consider artificial turf as a way to solve erosion and drainage problems and to aid in visual contrast. Prior to the first installations in 2001, airport service vehicles would frequently travel off the access roads onto the grass, tracking mud and dirt onto the runways. Paved areas were painted green to aid in visual contrast but this would soon chip and peel off. The first trial installations were a big success requiring no additional service beyond simple regular maintenance. 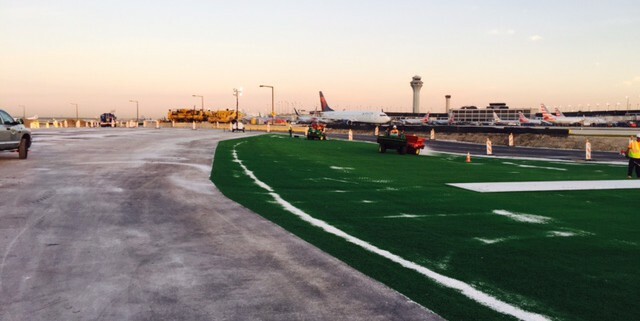 Installations are again well underway to cover more paved and grassed surfaces of the airport – the sand used for this current phase of installations is TTII’s high-quality infill sand from our Ottawa, IL plant.